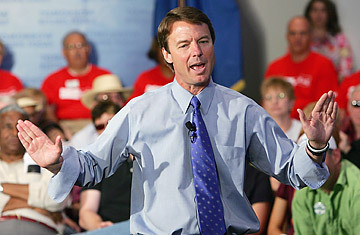 Edwards Rejects the "War on Terror"
Democratic presidential candidate John Edwards speaks during a town hall meeting at UNLV in Las Vegas, Nevada, April 30, 2007. Campaign-hardened Republicans used to treat the phrase "global war on terror" so casually, even affectionately, that they talked about "the G-WOT," after the four-letter abbreviation used in White House calendars to denote Iraq messaging meetings. Democrats embraced it, too, with John Kerry asserting during his acceptance speech at the Democratic National Convention: "We are a nation at war, a global war on terror." But increasingly the phrase is being regarded with hostility by many Democrats, who view it as little more than propaganda, and with a degree of skepticism by some Republicans, who consider it tired and vague. The left lobe of the blogosphere roared its approval in March when the House Budget Committee directed its staff to eschew "global war on terror" and instead use more precise language like "the war in Iraq" and "ongoing military operations throughout the world." And last month the British government announced that it too had retired the phrase. Now Kerry's former running mate is declaring his independence from a phrase that politicians have been brandishing with brio for more than five years. At last month's Democrat debate in South Carolina, moderator Brian Williams asked the eight candidates: "Show of hands question: Do you believe there is such a thing as a global war on terror?" Senator Hillary Clinton's hand shot up. After hesitating noticeably, Senator Barack Obama joined her. Edwards did not, even though he has used the phrase himself and a policy paper on his Web site refers to "winning the war on terror." And now, in his first interview to explain his turnabout, Edwards tells TIME that he will no longer use what he views as "a Bush-created political phrase." Republicans, too, are trying alternate formulations. Former New York City Mayor Rudolph Giuliani tells TIME that the phrase "served its purpose for awhile" but should now be superseded. "I have been referring to it for quite some time as 'the terrorist war against us' - not just America, but people who think like we do, basically the ideas of modern democracy," Giuliani said. "In order to deal with the terrorists' global war on us, we have to be on offense." Even Bush has nodded to shifting nomenclature, telling students and business leaders last month at Tippecanoe High School in Tipp City, Ohio: "Now we're involved in a  I call it a global war against terror. You can call it a global war against extremists, a global war against radicals, a global war against people who want to hurt America. You can call it whatever you want, but it is a global effort." The president, who has been using the phrase since at least June 2002, drew laughter in 2004 when he told a convention of UNITY: Journalists of Color Inc.: "We actually misnamed the war on terror. It ought to be: 'the struggle against ideological extremists who do not believe in free societies who happen to use terror as a weapon to try to shake the conscience of the free world.' "
A White House official who has been intimately involved in shaping Bush's war dialectic said the president will continue to talk about the "global war on the terror," even if it "doesn't fit a political science definition." " 'War on terror' is what I think resonates most with the country," said the official, who insisted of anonymity because he is not a spokesman. "That's probably because it was the term that was used in the immediate aftermath of the attacks on September 11th, and because everyone knew what we were talking about. And it's accurate." Edwards, previewing the foreign policy he will unveil in coming weeks, made it clear that his objections to Bush's world view are not merely semantic. Indeed, the Edwards foreign policy will be built around a rejection of the Bush doctrine, which puts a primary emphasis on the projection of American military power. "Americans are completely prepared for, and receptive to, an alternative approach," Edwards said. "I don't think they would accept an approach that did not include a component of strength. Our capacity to lead requires that we be strong - and that we have the moral authority to do it." The "Bush doctrine" originally referred to the President's insistence that those who harbor or aid terrorists will be treated like terrorists themselves. It now includes two additional elements: preemption, which calls for confronting the worst threats before they emerge; and Bush's "freedom agenda," which argues for nurturing democratic institutions within the Middle East as a way to deal with terrorism at its root. But the truth is that the war on terror is destined to outlast a change in the Oval Office  or in vocabulary. Mike Allen, a TIME contributor, is the author of "Mike's Must Reads" at Politico.com.